Valentine’s Day has been dead and burried for a week and so The Last Hurrah was ready to make it’s triumphant return the Maryland Ensemble Theatre. This week Kevin Cole was joined by Isabel Duarte and Christine McQuaid, the three connected over going off the rails post break up and discovered a world of people looking for love on the internet. If you’ve ever skimmed Craigslist’s Missed Connections, you won’t want to miss this episode. 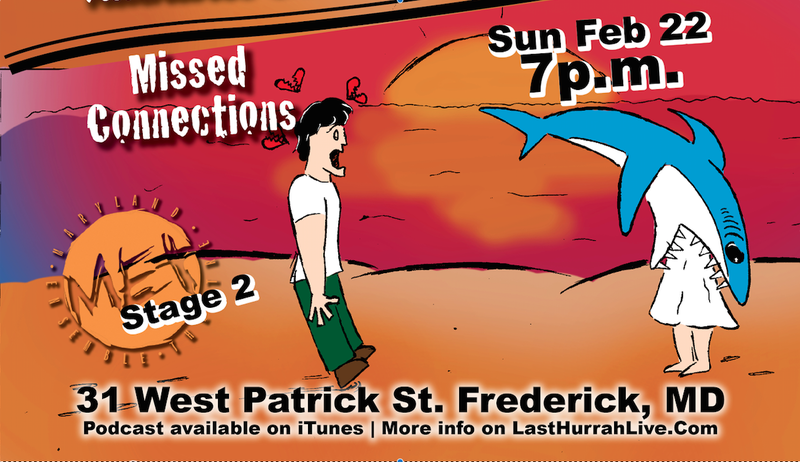 Join us for the next show Sunday March 1st at 7pm at the Maryland Ensemble Theatre.